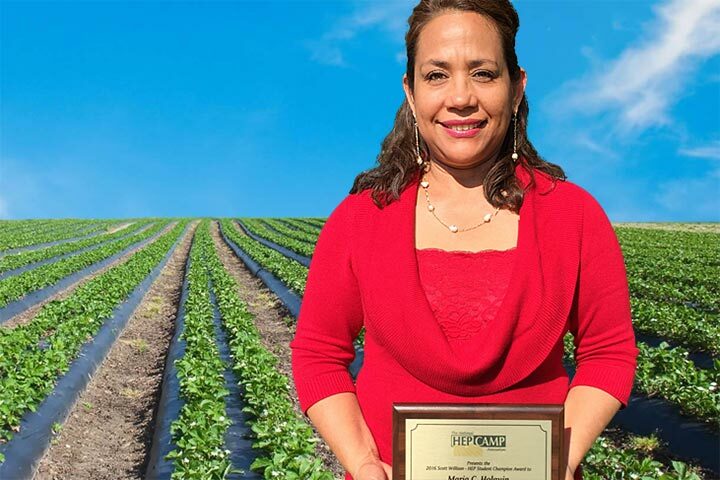 Burcham Elementary School Parent Maria Holguin has won a top national honor for seasonal or migrant farmworkers. She was recognized for being a model student as she earned her high school equivalency diploma through a program offered in partnership with Cal State Long Beach. Holguin received the award in Sacramento last week during a conference of the National HEP/CAMP Association. She is the only person in the nation to receive this year’s award. The association includes universities, colleges and nonprofits that administer a High School Equivalency Program or College Assistance Migrant Program. One day while helping one of her two daughters with her math homework, Holguin became frustrated because she was unable to understand the material. That’s when she decided to go back to school. She became involved in the Long Beach Unified School District’s Migrant Education Program, leading her to pursue the equivalency program at the university, where LBUSD Senior Interpreter Oscar Herrera taught the HEP diploma test prep class last school year. Holguin is a parent volunteer at her daughters’ school and is actively involved in various parent advisory groups in the local community. After receiving her high school equivalency diploma in May, she continued her education by enrolling in coursework at Long Beach City College. Learn more about the school district’s programs for migrant families.